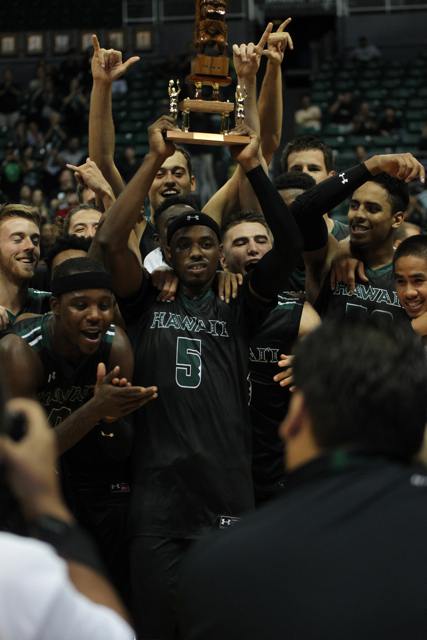 Roderick Bobbitt went coast-to-coast and softly layed in the ball off the glass with 1.4 seconds remaining early Tuesday morning to lift Hawai’i to a thrilling 76-75 victory over Nevada and the Outrigger Resorts Rainbow Classic championship. An energetic and vocal “Blackout” crowd of 2,143 at the Stan Sheriff Center and a national ESPN2 TV audience braved the 11 p.m. Monday tip-off and watched the Rainbow Warriors improve to 3-0 when the final horn sounded at 1:20 a.m. Tuesday. The Wolf Pack fell to 2-1. Nevada guard Marqueze Coleman, who finished with a game-high 34 points, scored on a driving layup with 5.6 seconds left to give the Wolf Pack a 75-74 lead after Mike Thomas’ three-point play had put the Rainbow Warriors ahead, 74-73, with 15.9 seconds showing on the clock. Hawai’i was out of timeouts when Coleman scored his last basket, but didn’t need one as Bobbitt took the ensuing inbounds pass and raced down the right side of the court before gently scoring the winning basket over a Nevada defender. The Rainbow Warriors jumped out to leads of 10-4 and 12-7 in the first four minutes, but Nevada responded with three quick baskets in a row to take a 13-12 lead with 13:20 remaining in the first half. Aaron Valdes then scored on a putback to ignite a 13-2 run capped by Isaac Fleming’s tough layup in traffic to put UH ahead, 25-15, at the nine-minute mark. The Wolf Pack cut the lead in half to 29-24 on Cameron Oliver’s layup with 6:11 left, but Sai Tummala scored a layup to start the Rainbow Warriors on an 11-4 surge to end the half up, 40-28. Hawai’i stretched the lead to 46-30 after a 3-pointer by Valdes four minutes into the second half, but Nevada clawed its way back and closed to 63-62 after Coleman’s driving layup with 4:46 remaining in the game. The Wolf Pack then took its first lead of the second half, 64-63, on D.J. Fenner’s 12-foot jumper with 3:54 left. After several more lead changes, Nevada took the lead at 75-74 on Coleman’s layup with 5.6 seconds remaining, setting up Bobbitt’s race to the finish. Valdes led the Rainbow Warriors with 18 points, Quincy Smith added 10 points and six rebounds and Tummala added 10 points and five rebounds off the bench. Bobbitt also finished with 10 points. 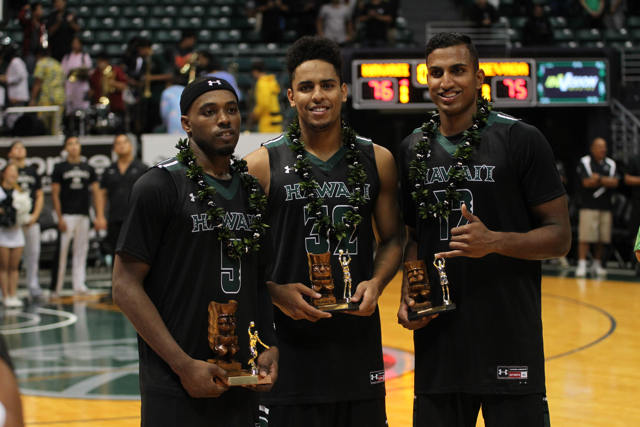 Valdes and Tummala joined Bobbitt on the All-Tournament Team. UH shot poorly from the free throw line, making just 14 of 27 attempts (51.9 percent). The Wolf Pack, meanwhile, finished 23 of 26 (88.5 percent). The Rainbow Warriors will return to action vs. Nicholls State at 7:30 p.n. Sunday at the Stan Sheriff Center. Time is on our side for total improvements! No need to worry about minor stuffs to distract ourselves. Luck stick to those who worked-hard and learned! Good win vs former rival Nevada. Only time will tell if this is a quality win for example last years win vs Pitt ended up not being a quality win because they ended up having a losing season. the heart and effort.. is great for this team.. can carry them a long way, very unselfish team.. I make prediction.. just looking at the remaining schedule pre BWC? UH.. including the DHC.. if NO major injuries to several key guys..plus working on those weak areas..No rim protector..cannot stop athletic guys going to the rim. Bold prediction.. I stick to.. UH will be 13-0 including the DHC championship.. And a road win against Texas Tech..! BWC? They can go 14-2.. end up before the BWC tournament? record overall= 27-2..!! I lied. It was exciting! The best part is that after winning Ganot has things in store for more improvements, and there are many. Nev.’s Coleman almost singlehanded won it for them. We had no answer for him in the second half. Leahey and Branch did a good job. Basketball is good. That was good basketball. Classic. First half was the best half of ball I seen this year. Second half game changed, Bows adjusted strategically and mentally and finished. Bobbit has the Bball IQ of a genius. Shaking my head that this team has a new coaching staff new system and plays this good in November. More in house, turnstile attendance for this team, hey near 6000 EVERY night when 700pm starts.. .this team deserve it.. Rod is the general. ..when needed he got the job done.. incredible quicks and finish. Sure, work in progress. on national stage, they did great.. just like a post season team already. I know Eran is smart, always the tactician.. he will identify the areas to work on ,.and have team work on.. Free Throws. ? matter of legs.. repetition..good form.. and knocking them down. .eran or staff cannot shoot them for the team.. I believe. guys put in the work.. this team will end up being really GOOD FT shooting team ! Ten dollars for a game this good? Who ever paid that should be cited for theft. Who ever didn’t go should have your head check. Two good coaches good teams. Another building block in place. Stepteau and Drammeh needs to get in the rotation by playing good in practice. Players getting to feel the new system. When this system becomes 2nd nature to the players, expect greater things. Bobbitt is the coach on the court. Without his leadership and his IQ of the game the new system being employed could have been way more difficult to have this type of success early on. It also helps a lot when your off guard can adapt as well and understand what needs to be done. When Flemming can get into the flow and accept the system 100% this will only help him to perform at a higher level. I believe they can win 20 plus games if they continue to improve in working the system. I was a little concern the players adjusting but after 3 games it is showing their is greater potential. The way fouls are going to be called resulting in more fouls called, free throw shooting must be made 75% of the time. Hawaii getting this part of the formula down too will only enhance the number of wins that can be attained which in turn may get them to the big dance. Unforgettable night at the SSC. Thanks for the memories, ‘Bows. Basketball purists will know that was not great basketball but the main thing got done and that is a win is a win! As I and many others said before the season started, the schedule is set up for 8-0 start before Diamond Head. Coastal Carolina and Nevada were the two top tests for UH before Diamond Head and UH got both. 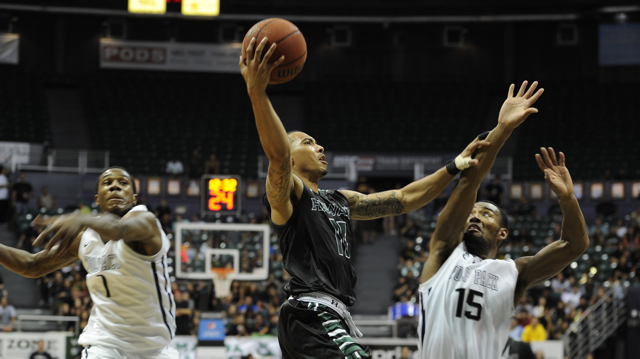 The 8-0 start will give UH a lot of confidence and momentum going into Diamond Head. Forgot to say congratulations to Rod Bobbitt! He putting his name as one of the best point guards in UH history! You think UH needs to work on FT’s. Look at BYU yesterday vs. Long Beach St. BYU lost 66-65. BYU is ranked No. 58 in Pomeroy Ratings, Long Beach 236. This is why they lost: BYU sharpshooters shot 8 for 21 in FT’s or a paltry 38.1 %. They missed 13 FT’s. Long Beach St. 15 of 23 or 65.2 % on FT’s. It’s very early in the season, but Cal Poly with 0-2 record is rated 96 in Pomeroy. Next is UH at 107 and then UC Irvine at 114. 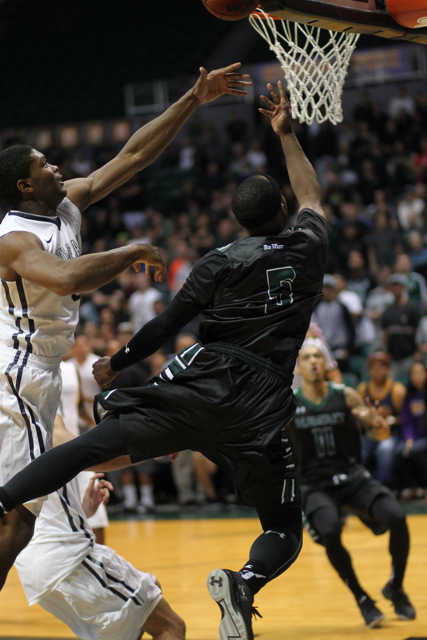 I’m not sure that Nevada or Coastal Carolina are the toughest test for Hawaii before the Diamond Head Classic. I’m a little more worried about that ONE road game we have in 10 days. I’m thinking Texas Tech on the road will be pretty tough. Despite Texas Tech being 13-19 overall last year (playing in the powerful Big 12), they had an impressive 10-3 record before Big 12 play. They’re actually a pretty good home team and they had nice wins last year at home against #9 Iowa State, Kansas State, and Oklahoma State. If Hawaii CAN win that game at Texas Tech, I guarantee you people will start noticing Hawaii. By the way, it’s way early, but our RPI is currently #59. Not bad. njacinto, you may be right but I keep thinking that Texas Tech is picked to be last place in the Big 12. In that very link you posted for RPI, Hawaii at 59 and Texas Tech at 240! That alone shows you that Hawaii can be considered a favorite for this game even if it is on the road. I think this Hawaii team can be special but if they want to get any respect around the country, they have to win games against last place teams no matter what conference and especially teams with such low RPI. Traveling for road games always tough for UH teams, but I think this game definitely can win. I will stick to my prediction of 8-0 before Diamond Head as a realistic goal. Lets Go Bows! sorry you guys. I don’t think its measuring what you think its measuring. Long Beach State = 17 ?!? Are these guys that good ? UC Irvine = 10 ?!? Pretty sure these guys don’t show up in the UPI or AP polls. I don’t know but I don’t think this is like the rankings we usually think about. I do see New Mexico, common opponent to Nevada and UH at about 41 on the UPI poll. And of course possible opponent Oklahoma at #8 on the UPI. Bottom line? BWC ONE NCAA bid league.. no matter how you finish overall record.. if UH does not win the BWC tournament title, like the WAC last year they were in.. UH will not go anywhere except to CBI or CIT, which NOW.. UH will pay for team to play in, for sake of the guys. NIT? UH HAS TO WIN regular season crown.. so for the Big prize.. win BWC tournament.. BWC.. all these recent years.. no respect.. so no At large invite from NCAA..
so Being Real? sad, as everyone knows.. UH out in the mid pacific.. hardly any respect, would have to win several NCAA MBB national titles. then maybe..
near 14 years since last NCAA invite.. that is a long time.. hope they win BWC tourney this year. this might be the year.. if no one is ill, physically or emotionally. next step? since Rocha went to one in 1972, the Bill Walton UCLA champion soph. year.. with Fab Five, and Riley went 3 times over 20 year period.. if get into ncaa tournament.. win a couple of games. in fact be this year’s Cal Poly and win ONE game. the first round would be historic. if team can shoot well and defend half court.. maybe this is the year ! are the fans.. I mean about 7000 or so, in SSC and following on the blogs.. getting too excited, hyped up too soon.. maybe.. we just hate that March let down.. horrible and ulcer time..we have to see, one game at a time.. I was getting excited too, until talked to ex UH athlete, a very good BB guy of past 20 years.. he said. man it is nice.. however have to wait until End of season, and getting to Dance, before, diving on the floor, and jumping on a pile on the floor, ala what Kalia McGee and Jarin Akana did in Salt Lake City , Utah, after upsetting top seeded BYU.. in old WAC for NCAA invite..
Go Bows.. shoot better or strengthen legs.. poor FT shooting can become pandemic…. true what Bobby C. said. if guys are great outside shooters.. great form, like Zane Johnson…good Free throw shooters..oh well, still early, however nice to win on ESPN ! Go Bows ! Coaching need to do better too! We are going for total improvements whole season long, O.K. ? It’s fun to win a game in this fashion…BUT…piling up on the floor after beating a team picked to finish 9 out of 11 in the WAC? After losing a 16 point lead, shooting 52% from the free throw line? You gotta act like you’ve been there. Especially on national TV. Last two games Bobbit not dishing off like first game, and his shot was way off…would like to see him get back to a few more assists. Super happy that Sai looks like he’s the real deal. I thought the foul on Aaron should have been a Technical. yes, that is part of being mature, championship quality team, from top to bottom, players and staff. win and lose the same way with dignity.. as for that trash talking.. cannot go on.. UH will have a reputation. and in key games.. get Technicals called on them.. see if coach can clean that up.. guys just play. I wil do talking to refs, and encourage each other, celebrate with each other, by handshake,or high five, however. with class.. that is something instilled on youth leagues , and even older makule athletes of yesterday..win or lose.. and play with high character..
Kelly…..last year was last year. Nevada got themselves a former NBA coach to coach them so you not talking about winning against some lower level coach who does not know what he us doing. As for the celebration ……I don’t understand your objection to it. It was an exciting game on national Tv. We don’t get many chances to play in front of a national audience and game like this can sway recruits who are watching the game. They want to be part of something exciting. Nevada was 2-0 and we was playing for a tournament championship. Geez……..didn’t know being excitied after beating a 2-0 D1 team from a conference better than the BW(Mountain West) is not a good thing. Can we save the post-game rush the court antics for a top 25 team maybe and not one that is currently ranked 5th in a conference that will get 0 at-large bids for the NCAA tournament? The true test of this team will be getting wins on the road in the BigWest. Until then, we stay humble. BTW…..you need to get your fact straight …..Nevada plays in the MWC and they perennial put 3-4 teams into the NCAA tourney so you not talking about a scrub conference. UNLV…….SDSU….Boise State….New Mexico….and CSU are all tournament level teams. So I say we deserved to celebrate like that. Ha! Same person hiding under multiple usernames to legitimize his disapproval of the rushing and piling to celebrate a tournament win. Just pathetic. First off, I applaud the team for piling atop Bobbitt. We can’t criticize the players for their way of celebrating a trophy. They worked hard and achieved their goal. The atmosphere at the SSC was intense and it definitely fed the players’ emotions. Secondly, only 3-5 students rushed the court. KelleyO, were you at the game? I think the court rush/pile up was because of the tension at the end of the game and the excitement of Bobbitt pulling out a win when the team thought they were going to lose. You don’t have to be on TV or be playing a top 20 team to get emotional about that. It was a championship game, albeit the Rainbow Classic. I like the enthusiasm and emotion of the team. It was definitely an exciting win. Personally, I think the enthusiasm and excitement showed by the team during and after the game can only help the program. The UH football team has been SOOO bad and SOOO discouraging, that Hawaii fans badly need to be excited again over a UH mens sports team. This is the team! Furthermore, I think the fans feed off the team, and the team feeds off the fans as well. With our current schedule and added confidence, I think this team can go 7-0 before the Diamond Head Classic, as long as we go to Texas Tech and steal that road game. When it’s Diamond Head Classic time, I have a great feeling we’ll make a BIG SPLASH during that tournament. I won’t even talk about the Big West season yet…. just win one game at a time. I agree with those who say let the boys celebrate. The crowd was great! After Bobbitt made the layup, those of us who were at the game were all acting a fool. No reason why the team can’t do the same. They are the ones who put in the hard work so we can go crazy. Really appreciate the videos and interviews. Can’t really find videos elsewhere. Bobbitt said it best by saying that it was the first time he made the winning bucket. If they didnt celebrate i would think that something was wrong with the team. Saw that Thon Maker set now for a visit to ASU, coming from Sydney. Any chance he could stop by here and talk the Australian talk to our Melbournian players ?? … closer to home ! they were happy fine.. eran going have to take care of responding to trash talk, the refs, and the emotions..this team has to just work towards the BWC tournament.. all this preseason and BWC regular season things okay fine..have a near undefeated record overall, however if not win 3 games in 3 days in Anaheim.. there goes the ncaa bid..
With a championship under their belts, the methodical coaches would find many motivations to encourage and prepare every player to bring home a W! Which would ultimately set the tone for future road game confidence as well as into the DHC performance. Geo Washington won by 60-54 in 2014 from Wichita St, a team these guys almost beat. We can be cautiously optimistic on welcoming our upcoming challenges! Uhfanzonly1, you’re pathetic in your anti-Ganot comments. Did your man crush Gib win the BWC title? Did he take us to the NCAA tournament? Uhfanzonly1, can you please switch your username back to KelleyO and respond to the question in my previous post? If team went crazy mid tournament that would be an issue Being excited for winning tournament is fine – shows passion with plenty of time to re-group and re-focus Passion says more about team cohesion The bench going crazy says they feel part of it What more do people want If they sat there disinterested or sulking because Ganot only likes to play 7-8 players we would have bigger issues!